You’ve installed your new Fine Material Screw Washer and are already beginning to reap the benefits of Eagle Iron Works’ standard line of screw washers, which include an extremely low operating cost and a shorter return on investment provided by the Dodge Torque-Arm II gear reducer. Your CONDOR is washing, dewatering and classifying your fine material, leaving you with a sand that is drier, more saleable and free of deleterious material. Since your CONDOR Fine Material Screw Washer is performing so well, chances are you’re going to want to maintain or maximize that efficiency to get the most out of your machine. You can ensure that your CONDOR Fine Material Screw Washer is performing efficiently and retaining the desired product gradation by simply checking the weirs, the incoming water to the feedbox, the rising current classification water and the screw shaft speed. You can also evaluate the material itself as well as the feed. Controlling all these factors can aid in the removal of fine mesh material. Overflow weirs allow fines to be removed from the product. Three adjustable weirs on the CONDOR Fine Material Screw Washer tub give producers control over the amount and size of the fine material they remove by providing them with the ability to manage the overflow depth and velocity. The adjustable weirs also allow producers to retain the maximum amount of material even during out-of-level conditions. Keeping the weirs level provides a low overflow velocity, allowing less product-size material to be lost over the weirs while the unwanted sand is removed. Less product-size material lost equals an increase in production. If you notice excess fines in your product, you can raise the side weirs and lower the back weir to remove those excess fines. In contrast, lowering the weirs allows more waste and fine material to be removed with the overflow. The water in the Rising Current Classifier helps aid in the separation of deleterious material from your fine material product by carrying lighter fine particles and foreign material over the overflow weirs. If you notice product-size fines are overflowing any part of the CONDOR Fine Material Screw Washer, you can reduce the flow of water into the pool area, or turn it off completely if necessary. CONDOR Fine Material Screw Washers are designed with a submerged screw shaft surrounded on three sides by overflow weirs and on the fourth side by a baffle plate to reduce turbulence and encourage the settling of the particles. Sometimes when product-size fines are being lost, it is due to an improper feed of the slurry into the machine. Because you want the product-size fines to settle, the water in the washer tub needs to be as calm as possible. Turbulence can be reduced by ensuring the slurry feed is directed to the discharge side of the baffle plate. The screw shaft speed on a CONDOR Fine Material Washer is determined by the percent of material that passes the 50 mesh sieve for the product gradation produced. When operating at the proper speed, the screw shaft can ensure the maximum amount of product is retained. While screw shaft speed is often set by the manufacturer, there are instances when a slower screw shaft speed can benefit the final product. For example, if the water velocity isn’t great enough to remove the fine material but the turbulence created by the rotating screw shaft is too great to allow the fine material to settle out, the screw shaft speed can be slowed to reduce the turbulence. Screw shafts turning at a slower speed give fine material more time to settle in the tub, which means more saleable material. Since the capacity of CONDOR Fine Material Screw Washers is partly determined by the screw shaft speed, slowing down the screw shaft speed reduces the capacity of the machine. On the other hand, screw shafts that turn too quickly (faster than Eagle Iron Works’ slide chart recommendations) can result in excessive turbulence, which can cause a loss of product-size material. 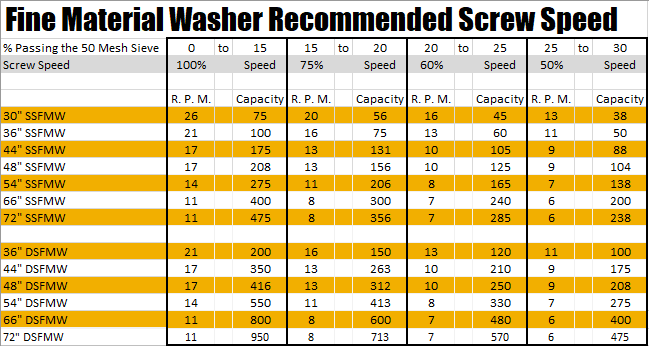 Eagle Iron Works' chart for CONDOR Fine Material Screw Washer recommended screw speeds. Before adjusting your screw shaft speed, you should contact Eagle's trained personnel for help determining the right speed for your operation. You should contact Eagle Iron Works before adjusting your screw shaft speed. Eagle’s trained personnel can help you determine the screw shaft operating speed that is best for your desired product. Flushing water plays an important role in the dryness of the material discharged from your CONDOR Fine Material Screw Washer by clearing the drain trough on the side of the washer that is opposite the curved plate. Adding flushing water into the dry deck area can leave you with a discharged material that has the least amount of moisture. You can ensure your CONDOR Fine Material Screw Washer is operating efficiently by examining the material. If you find you are not removing the desired amount of fine material, you may not have enough water going into the machine to do so. For every ton per hour of minus 200-mesh material in the feed, Eagle Iron Works recommends 50 gallons of fresh water to remove the fine material. Another way to make the most of your Eagle Iron Works CONDOR Fine Material Screw Washer is to establish and adhere to a regular maintenance schedule. Conducting routine maintenance once per shift, once per week and once every quarter can ensure your CONDOR Fine Material Screw Washer is performing as efficiently as it should. Plus, routine maintenance checks can reduce downtime and lost production by catching potential issues before they cause an unexpected failure. Just be sure to make any necessary repairs or adjustments as soon as you identify a problem. Once per shift, all applicable components should be lubricated according to the lubrication requirements outlined in the CONDOR Fine Material Screw Washer manual. Proper lubrication of the bearings and of the seals of submerged rear bearings is the key to long bearing life. Take care not to overgrease the electric motor bearings, however, as overgreasing can block the weep hole designed for water drainage. Be sure to follow the specific instructions in the manual for how much grease to add and how often. Reducers, bearings and motors should be inspected for excessive heat once per shift; none of these components should be hot to the touch. Electrical cables, water lines and all connections should be inspected for wear or damage. Finally, belts should be inspected for proper tension and alignment. Check to see the belt is not worn or damaged; if so, it should be replaced. Once per week, bearing housing bolts and motor bolts should be inspected for tightness. The area around the motor fans should be inspected for cleanliness, and the seals should be inspected for proper performance. Once every three months, all bolts and fasteners should be inspected for tightness, and all wear shoes and/or paddles should be inspected for wear or damage and replaced if necessary. You should always keep a stock of wear shoes so you can perform a quick replacement if and when needed. You should develop a maintenance schedule that will fit your operation. You can use the above example as a starting guide, including any additional procedures that you need or adjusting the inspection frequencies to correspond with historical inspection data. For example, if find the area around the motor fans is clean during every weekly inspection, you may want to adjust the inspection frequency to every other week. Create a maintenance schedule that works for your operation, one that you will stick to. Another way to make the most of your CONDOR Fine Material Screw Washer through maintenance is to clean out any material buildup. Before cleaning or performing maintenance to your machine, however, be sure you have read the manual in its entirety and that you are following all the proper lockout/tagout/blockout procedures as well as your site-specific safety procedures. After performing any maintenance, you should check to make sure all the components are working properly. If you need to store your CONDOR Fine Material Screw Washer or aren’t using it for an extended period of time, lockout/tagout all electrical controls. Remove the material from the screw washer and drain any water from the washer box and all water lines. Make sure the motor is kept clean and dry and the gear reducer is kept properly lubricated. Ensure the bearing surfaces maintain lubrication by rotating the screw shaft once a week for as long as the machine is not in use. Keeping your weirs level, monitoring your water levels and screw shaft speeds, and creating a maintenance schedule are simple things you can do to make the most of your CONDOR Fine Material Screw Washer. Following these practices can allow you to retain more product and experience less downtime. Don’t miss a future post about Eagle Iron Works! Subscribe today to learn more about what Eagle Iron Works equipment can do for you!